I grow my flowers and plant material which I then press and use to make greeting cards, pictures, paperweights, and other decorative items. All my plant material is ready to use in a few days and is sealed to prevent deterioration. As a member of The Pressed Flower Guild since 1993, I served on the committee in many positions, including President from 2009-2015. I am also a member of The World Wide Pressed Flower Guild and I have taught at their conferences in Los Angeles, Charleston, Philadelphia and others in the USA, as well as in China, Brazil and Taiwan. In 2018 I was chosen as a judge for the Pressed Flower Art classes at the Philadelphia Flower Show. I have contributed several articles for books and magazines in the UK. I am still learning and enjoy talking and demonstrating to others about how I work. 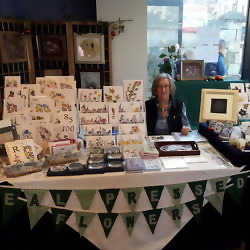 I also attend Craft Shows and Fairs, run workshops and seminars, and love showing others how to work with pressed plant material to obtain the best results.